Shopping Buddy is yet another ad-supported program that might be responsible for the advertisements flooding your web browsers. Needless to say, if you have installed this search tool willingly, it is very unlikely that you will suspect this program to be unreliable. However, if this search tool was installed by accident or even without your notice, you certainly should worry. The first thing you should clear up, in this case, is whether this ad-supported program is malicious and requires removal. After researching this adware, we believe it is quite important to remove Shopping Buddy from your operating system. When researching the distribution of Shopping Buddy, we found that there were more questions than answers. First of all, this advertisement-supported program does not seem to have an official download source. This is quite suspicious because reliable software is usually promoted in a transparent and clear manner. Even though some users believe that this is a reason to delete Shopping Buddy, the real problem, in this situation, is the software installed along with this adware. It is quite possible that the programs installed with this adware might be much more malicious. Even if you need to delete these programs, you should not underestimate the importance of the removal of Shopping Buddy itself. Shopping Buddy is published by Woodenshoesmedia BV, and it was found that it was created using the Kango framework. According to our research, this framework is often used for the development of ad-supported software. Unfortunately, this software can be very unreliable and might even require removal. If you accidentally install Shopping Buddy using malicious installers, you might encounter extremely dangerous threats that could be installed silently. Therefore, even if you believe that you do not need to delete Shopping Buddy-related malware, it is crucial that you install an authentic malware scanner to make sure that you do not need to delete truly dangerous computer infections. If you do not delete Shopping Buddy, it will introduce you to commercial advertisements and pop-ups. This kind of content could be harmless or could be extremely dangerous. Due to this risk, it is best to remove Shopping Buddy from your operating system. We suggest using automatic malware removal software, especially if this adware was installed with other threats. Note that reliable software can also guarantee the protection of your operating system, which is essential if you want to keep malware away. Some users do not want to invest in reliable security software, which, in the eyes of our virtual security experts, is extremely risky. If you are one of these users, we suggest you think twice. If you are set on the manual removal, you can follow the instructions below to delete Shopping Buddy from your Windows OS. This operation should not be complicated if other threats were not installed onto your PC. If they were – which you can check using a malware scanner – you would need to delete them as well. You should proceed with the removal of malware only if you know what you are doing. Navigate to the Taskbar at the bottom of the screen and Start. Identify the undesirable program, select it, and click Remove. 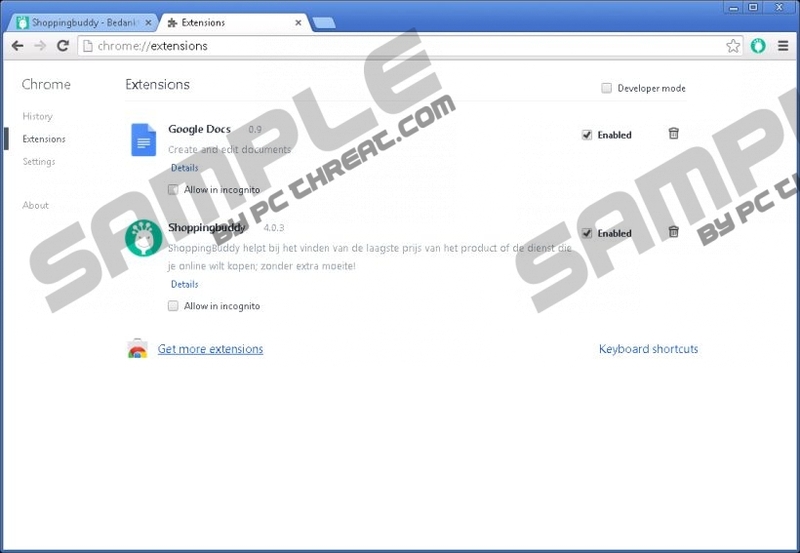 Go to Toolbars and Extensions and Disable the undesirable extension. Quick & tested solution for Shopping Buddy removal.